Some of the world’s most extraordinary scenery: brightly hued sandstone carved by wind, water and ice into a series of deep and huge amphitheatres with an unimaginable profusion of spires, towers and other excrescences, all with gorgeous colour and texture contrasts. There is a huge variety of walking options here, mainly day walks. Note: Neg: Heavy use on best-known trails in higher seasons. 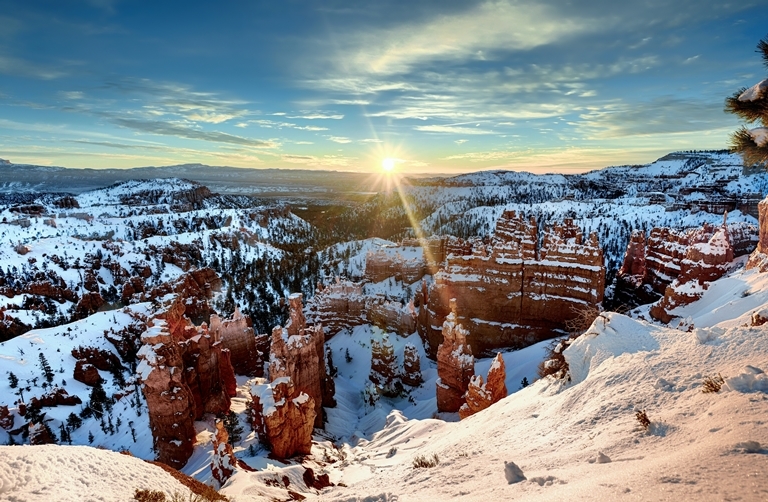 Utah’s Bryce Canyon boasts some of the world’s most extraordinary scenery: an extensive area of brightly hued sandstone carved by wind, water and ice into a series of deep and huge amphitheatres in which sit an unimaginable profusion of spires, towers and other excrescences called hoodoos, and arches and other formations. It is reminiscent of Turkey’s Cappadocia; its scenery is arguably even more amazing. 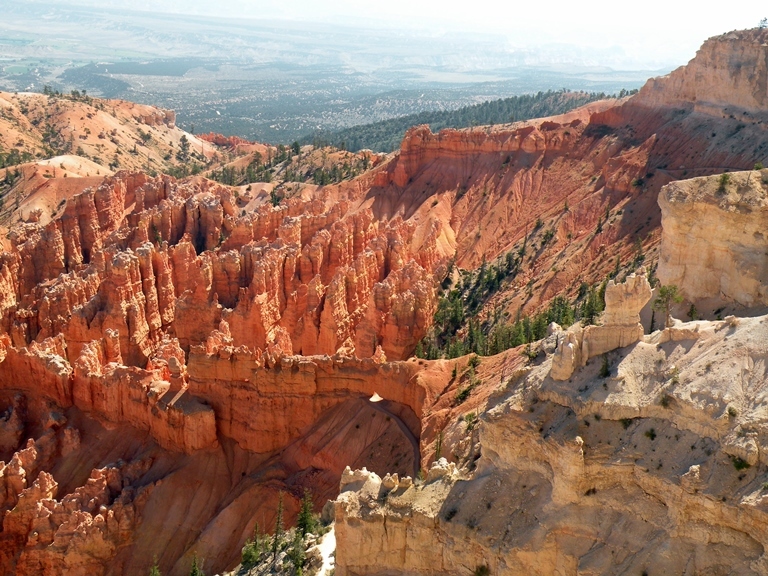 The hoodoos can be 200ft (60m) high, and (unsurprisingly) have a fascinating and complicated geological history. They are capped by a layer of harder limestone and conglomerate rock which reduces their erosion, resulting in often sheer-sided towers the size of their caps. Visually, the thrilling weirdness of the scenery is enhanced by gorgeous colour and texture contrasts: the greens of the prevalent ponderosa pines and spruce, and the often-blue sky, compliment the rocks’ oranges-to-pinks beautifully. The forests (and, somehow surprisingly, rough meadows) in the canyon shelter a surprisingly diverse fauna, including bears and mountain lions. Being actually quite high (the rim is at around 2,500-2,700m), the winters are hard here, indeed snowy, usually from mid November to late March. The summers remain relatively temperate, with thunderstorms in July and August. 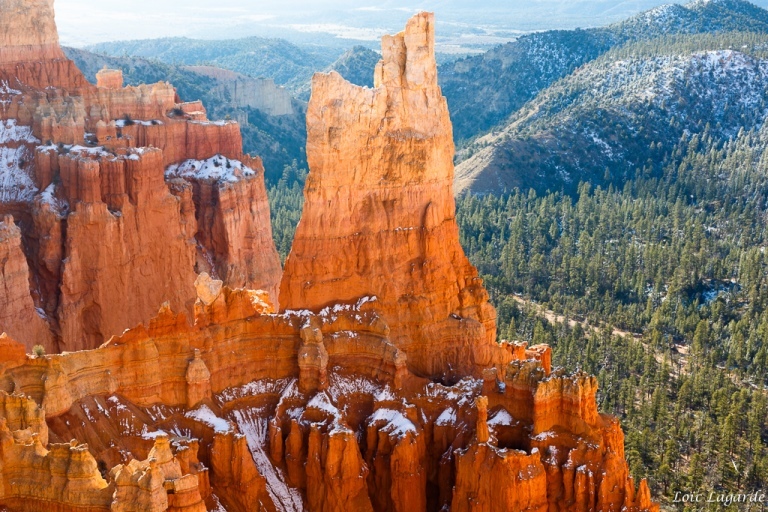 A joy of Bryce is that, other than a single road at one side, its interior can only be enjoyed on foot, although the best-known trails can get busy in high season. The access road to the heart of the area is behind the rim. There is a huge variety of walking options here. The north and central areas of the National Park contain most spectacular scenery. The Under the Rim Trail. 23 miles (but perhaps not as rich in splendors as some others). Winds under the rim of the western part of the canyon, away from the heart of the area. Beware lack of water. You can camp down here. Riggs Spring Loop: short (8 miles), but you are allowed to camp and it is full of fascination. In the less-extraordinary (but still extraordinary!) southern part of the park. 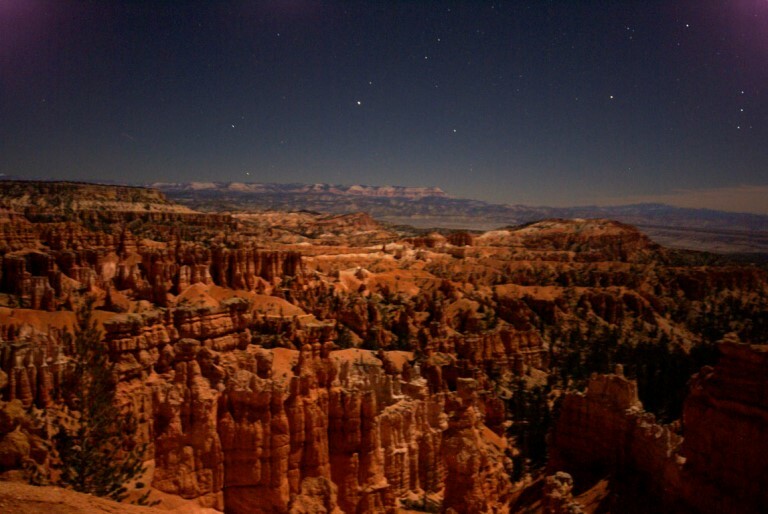 Longer day walks: these mostly require joining together some shorter walks, for instance the Fairyland Loop with the Queen's Garden Trail and connector, The Navajo Loop, and Rim Trail (which Walkopedia did); or the Peekaboo Trail with combinations of the Navajo Loop, Queen's Garden Trail and Rim Trail. Peekaboo Trail: Terrible name, but probably the best known walk in the area. 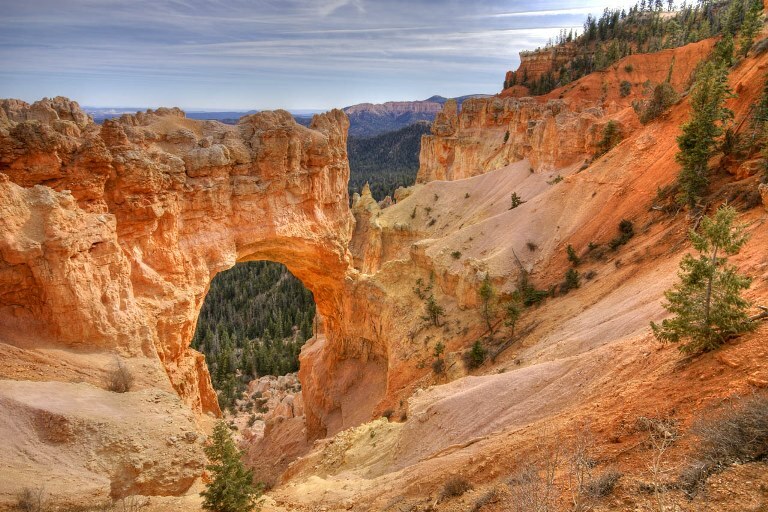 A 6ish mile (from Bryce Point) rub-your-eyes overload of weirdness, really outstanding formations and atmosphere. It does involve quite a lot of ascent/descent. Can be combined with the Rim Trail and other key walks. Fairyland Loop: an absolute classic, an 8 mile loop between Fairyland and Sunrise Points on the rim (descending into Fairyland Canyon, then Campbell Canyon, climbing back to the rim) then returning on the Rim Trail to Fairyland Point. 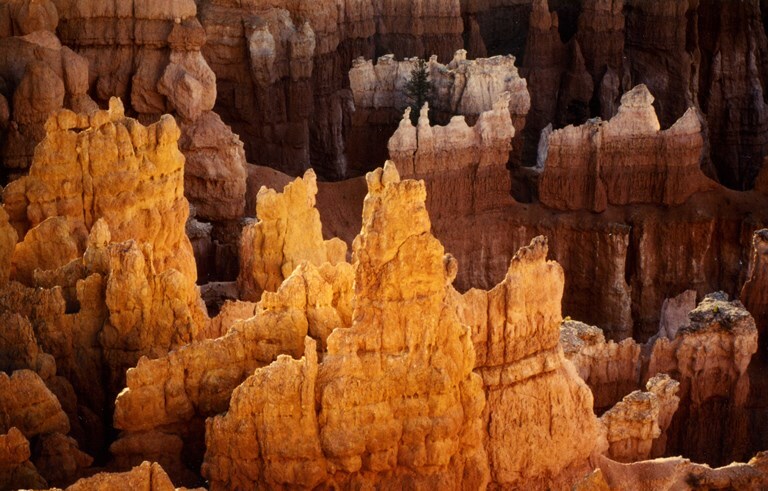 Wind through extraordinary formations, in what will feel like a psychedelic – nay psychotropic – experience. Navajo Loop: Superb shorter (1.5mile) walk from Sunset Point, taking in the amazing, steep, narrow Wall Street Canyon. Walk it with Queen's Garden. 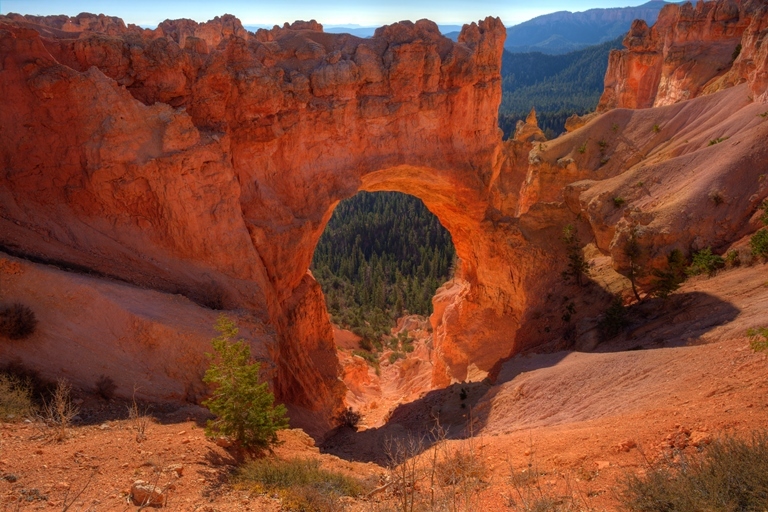 Queen’s Garden Trail: 1 mile of concentrated beauty and fascination down into the canyon, linked by the Queen’s Garden Connector to the Navajo Loop and Peekaboo Trails. 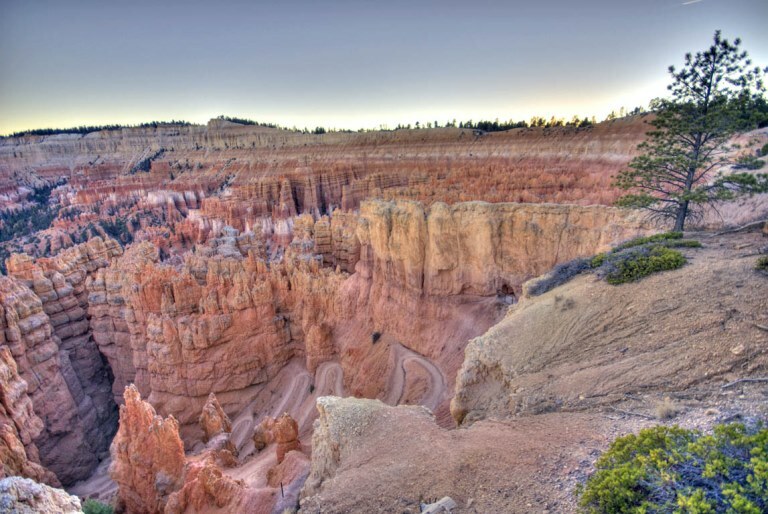 Rim Trail: an easy 6+ miles of visual superlatives on the … er…rim of the canyon. Links other trails to help you create wonderful longer walks. There are plenty of other walks to be done, so you could spend several rewarding days exploring different parts of the maze. Walkopedia walked the Faiyland Loop from Fairyland Point back to the rim, then down the Queen’s Garden Trail and connector and the amazing Wall Street ascent of the Navajo Loop back to the rim; and the Rim Trail back to the start, to make a circuit. 11+ miles; 6 hrs including lengthy view-admirations and endless photo taking. Often combined with Zion NP and the Grand Canyon. Walkopedia walked here as part of a Zion, Bryce, Goblin, Capitol Reef, Arches NP, Canyonlands, Monument Valley, Grand Canyon loop. Water is in very short supply. Bring plenty when walking within the canyon. You can lodge and camp within and near the park. 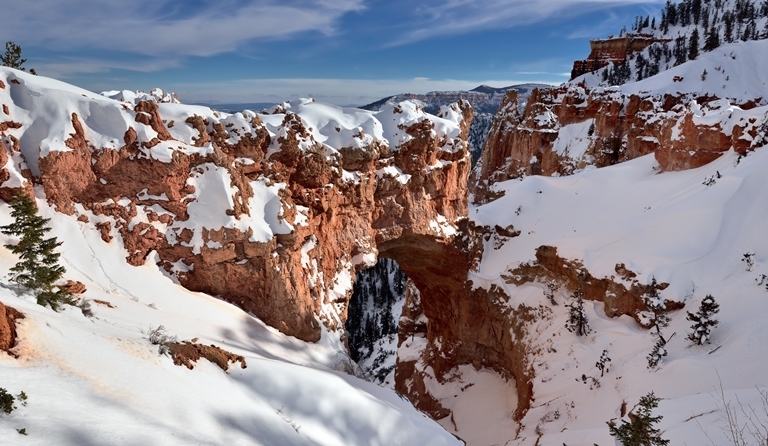 Best book: Cicerone’s The Grand Canyon with Zion and Bryce Canyon National Parks. Excellent in many ways, if perhaps a bit short on the feel of the place. Find relevant books on Amazon. We want to give even more information: Please help us by recommending your best walks/making suggestions and sending photos! Thank you!